Korean Inspired Pancakes, The Breakfast Of Champions! About a couple of months ago I decided to give Korean pancakes a try. They are salty, they are full of vegetables, and frankly they just looked exotically delicious. So I decided to make a classic; a green onion pancake. I printed a recipe from a reputable Korean cook, gathered my ingredients and went at it with extreme confidence, after all; How hard could it be? Well, I found out that there is a learning process to it. You can’t just add batter and fry, the onions release moisture, which make the pancake soggy if it is too thick. I learned that the egg has to be added at a certain time, that the green onions don’t always stick to the batter. Basically I made quite a few, but every try ended in me having to fix something since we Americans (at least the ones in my house) are not much for eating raw pancake mix, or raw egg, or slimy onions. So my first try ended in disappointment and me deciding that I had to get back to the drawing board to find a more “Americanized” taste. So fast forward a couple of months, and I decided to try it again. This time however I changed a few things. While I added green onions, I decided to make my life easier and dice them (Korean pancakes use the whole green stalk). I also decided to make them with seafood (shrimp to be exact). This recipe is the end result of a Saturday morning’s experimentation session. It is fluffy, filling, and delicious. I honestly recommend you give it a try. It is great for breakfast, brunch, or even lunch. It is great hot, warm, or at room temperature. -pancake batter (about 3-4 Tbsp per pancake). Follow recipe in box to make the batter. Season shrimps with salt, pepper and garlic. Make pancake batter by following the box instructions. Set a pan on medium heat. When hot add a tablespoon of olive oil and coat bottom of pan. Add 4 tablespoons of batter to the pan. Immediately add shrimp. Just set 4 shrimps on top and sprinkle chopped green onions. Meanwhile beat an egg and add salt and pepper to taste. When it is time to flip the pancake add the egg, let it set for a few seconds and then flip. Let the other side cook until shrimp is fully pink, which takes about 2 minutes. Take off the heat and serve. 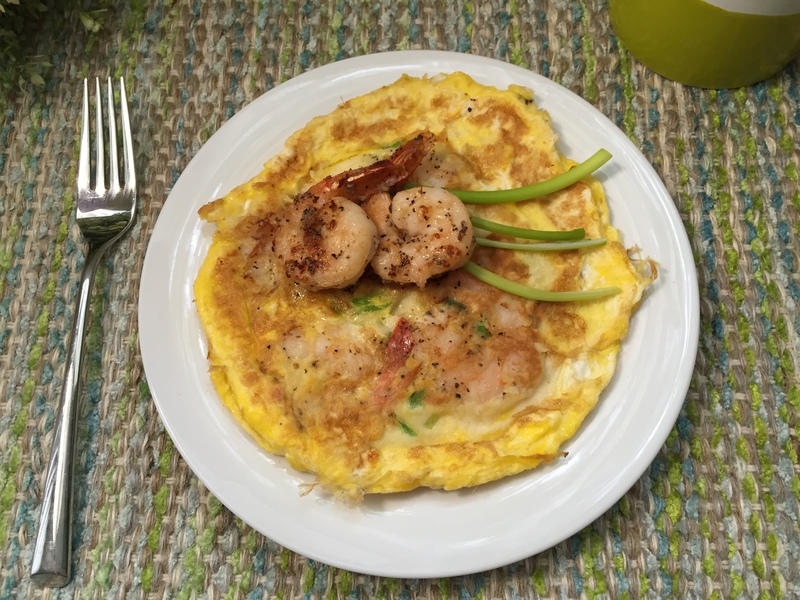 Garnish with green onions or leftover cooked shrimps. I can’t wait to try those Korean pancakes. we will go up on Sunday. make it again please.